Down to the corporate side! A lot of economists and economic historians study aggregated data, e.g. gross domestic product, inflation, trade flows, or productivity. Author JanMusschootPosted on August 27, 2018 October 7, 2018 Categories EnglishTags economics, innovation, jobs, knowledge management, managementLeave a comment on Down to the corporate side! Zijn de Duitse pensioenen onbetaalbaar? Wie in [het vergrijzend Duitsland] constante pensioenen voor de komende twintig jaar belooft, gooit hoge ogen bij het electoraat, maar is bezig met economische zelfmoord. Author JanMusschootPosted on August 25, 2018 August 25, 2018 Categories NederlandsTags actualiteit, Carsten Brzeski, economie, opinie, pensioenenLeave a comment on Zijn de Duitse pensioenen onbetaalbaar? 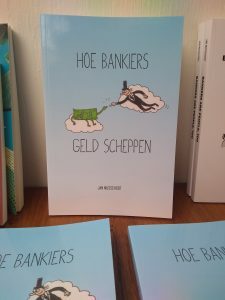 Blader je graag in een boek voor je het koopt? Dan is er goed nieuws! The financial news offers an endless stream of scary stories and opinions. Should you sell your stocks because of the news? Public service announcement: Brad Setser is the go-to guy for all things related to international trade and money. The central government debt of Turkey was 28 percent of the country’s gross domestic product (GDP) at the end of 2017. Although making financial predictions is usually a fool’s game, I’m pretty confident that by the end of 2020, the central government debt of Turkey will be higher than 40 percent of GDP. My prediction is based on the ongoing crisis. Private debt tends to become public debt in these circumstances. Because the debt is dollar-denominated, it cannot be inflated away. Check this post in 2021! The European support program for Greece ends today. Some called the program a bailout, others assistance or solidarity. Whatever you call it, the outcome has been abysmal. You did it! Congratulations to Greece and its people on ending the programme of financial assistance. With huge efforts and European solidarity you seized the day. Greece fared worse than the US during the Great Depression. Emerging markets recovered faster from financial crises than Greece did. The only countries that have shrunk more than Greece in the past ten years are failed states like Libya, Yemen, and Venezuela. “Congratulations” to all who were responsible for this “success”.